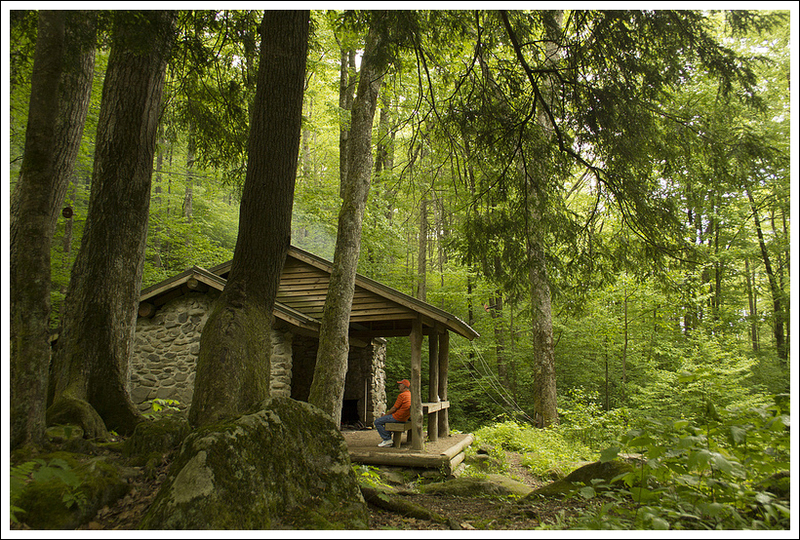 The 4-mile Kephart Prong hike ascends gently along a beautiful stream and end at the backcountry campsite – Kephart Shelter. 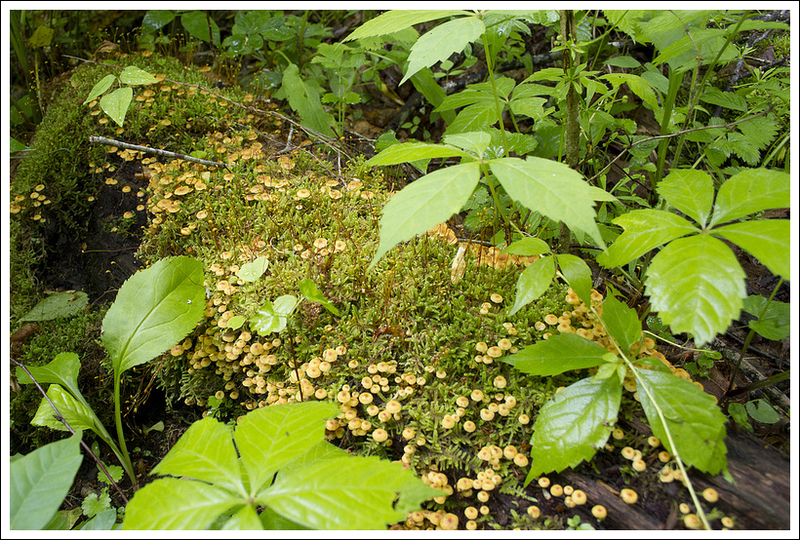 This hike offers lovely cascades, wildflowers and history. Adam crosses one of several log bridges over Kephart Prong. Below: The trailhead is located on the side of Rt.441. The first bridge takes you across the Oconaluftee River; The Oconaluftee is beautiful and cascading; So much of the Smokies seems to be wet, green and covered with moss. Our second day in the Smokies was earmarked for a hike to the summit of Mount LeConte, but we woke to gloomy weather. We decided that we didn’t want to hike ten tough miles and not even get payoffs in terms of views, so we devised a new plan! After redoing our Deep Creek Waterfall Loop Hike to get better photos, we were still ready for more hiking. I perused our hiking guide and found a trail called Kephart Prong. It sounded interesting – remnants of an old railroad and a CCC camp, a backcountry camping shelter and the trail followed a (possibly pretty) stream. After redoing the earlier hike, the 4-mile length of the Kephart Prong was appealing, too – short and sweet! Also, it had the benefit of being closer to the Bryson City side of the park where we were staying for the early part of our trip. It was still morning, so we grabbed a snack and made our way to the trail. What we found exceeded my expectations. 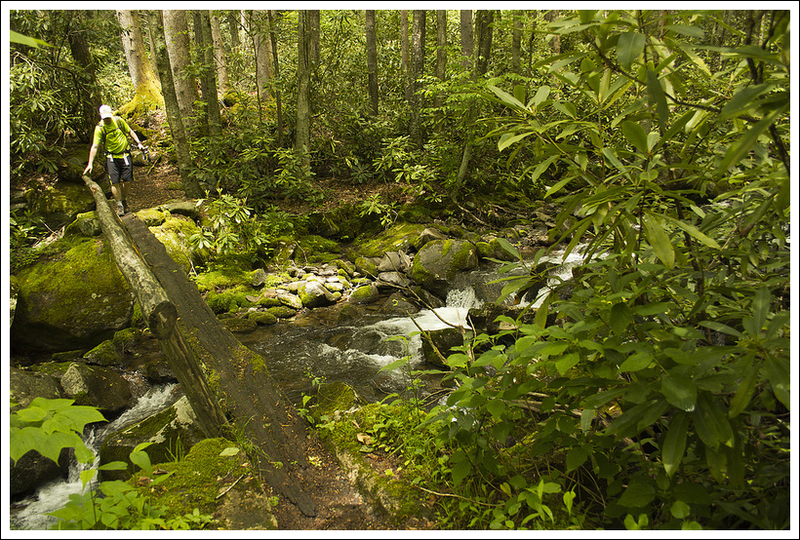 The stream was incredibly beautiful – rapids and small waterfalls tumbling over mossy rocks and fallen hemlocks. 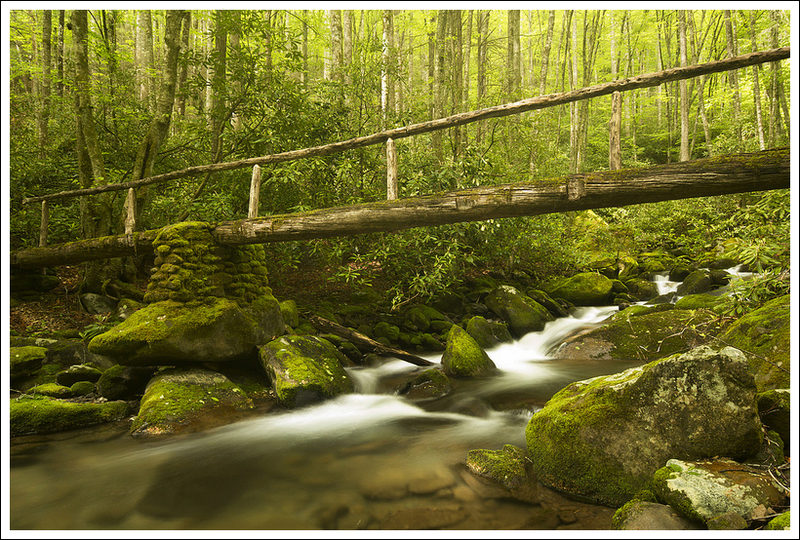 In at least four places, rough, hewn log bridges traversed the stream. The sounds of running water carried through the entire hike. 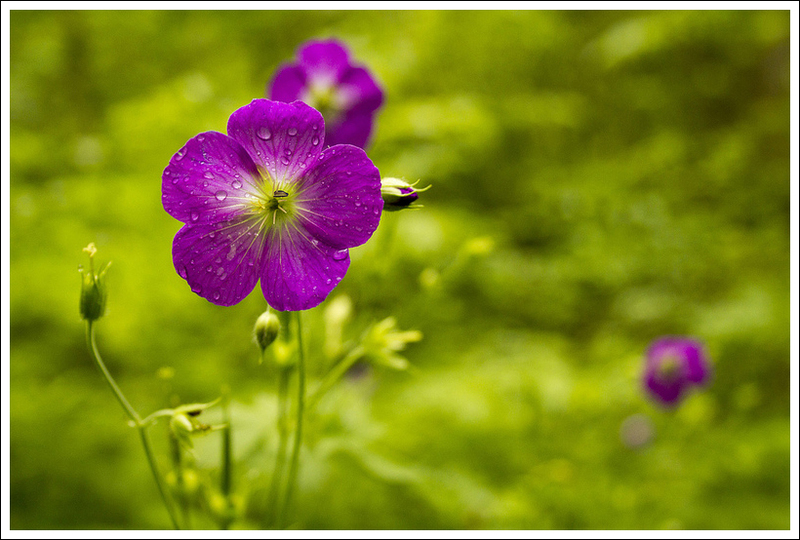 We saw lots of wildflowers – pink lady slippers, wild geranium, ragwort and many others I couldn’t name. There were many kinds of wildflowers along the trail. This might be a wild geranium? 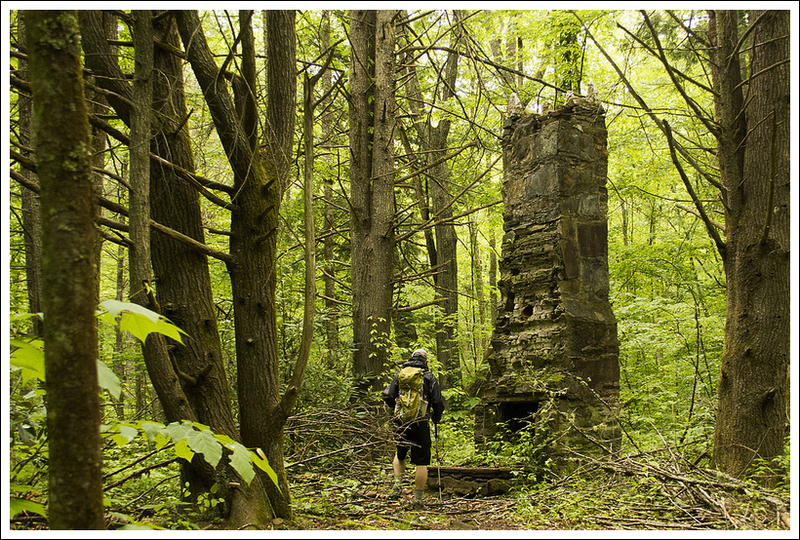 Below: Adam explores the ruins of the old CCC camp in the area. This chimney was supposedly located in the barracks; There was once a railroad and a trout hatchery in this part of the Smokies, so look for abandoned rails, train parts and pipes from the hatchery. 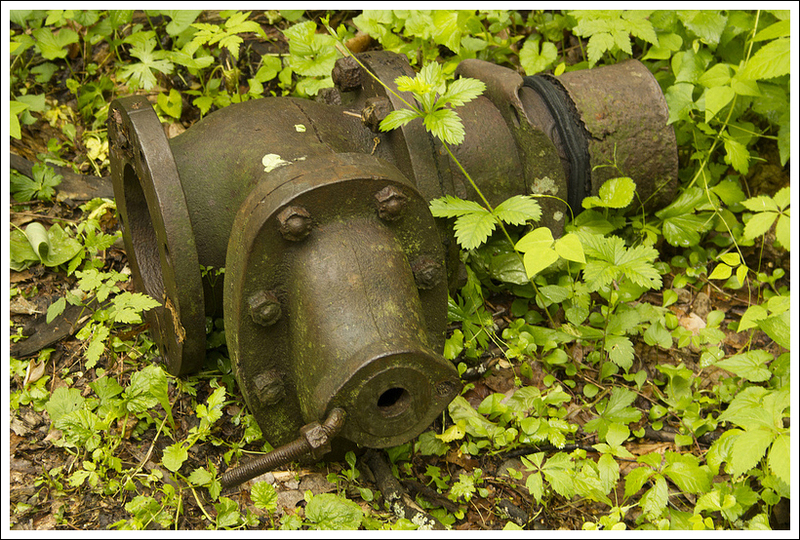 The item below appears to be an old pipe joint possibly; Another beautiful, mossy, log bridge over the stream. The hike climbed gently the entire two miles until eventually arriving at the Kephart shelter – a sturdy stone and timber hut intended for backcountry camping. We chatted with other dayhikers using the hut for a lunch stop and one man who was there for an overnight stay. Signs near the shelter showed that the Kephart Trail connects to the Sweat Heifer and Appalachian Trails. If we had continued to climb past the shelter, we would have arrived at Charlie’s Bunion in several miles. Despite the draw of the Bunion, lunch was a higher calling, so we made our way back down the trail. It’s amazing how much faster the climb down always goes! We got back to the car around 1:00 and were back in Cherokee by 1:30. We couldn’t find anything that sounded good and was actually open on Sunday, so we pressed on back to Bryson City and ended up at a place we found on Yelp – The Bar-B-Que Wagon. They served great, traditional Carolina style pit barbecue with all the expected sides. We sat at a picnic table by the river and enjoyed an enormous, late lunch. After lunch, we thought about going back to the hotel to shower, but instead we pushed on to visit the NOC (Nantahala Outdoor Center). The complex has a fantastic outdoor outfitter and a super cool riverside patio bar (Big Wesser BBQ + Brew). We got a few drinks and watched rafters and kayakers working the rapids. So relaxing! What a great day! 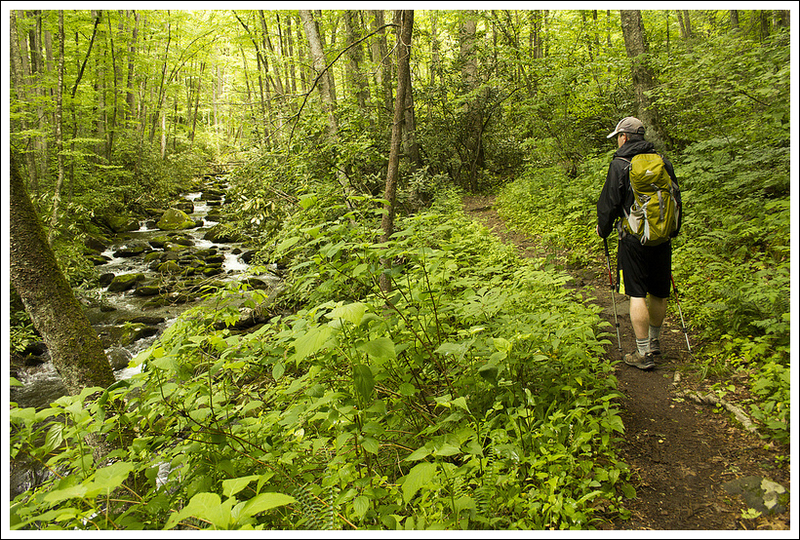 The Kephart Prong Trail is one of the most definitive picturesque, riverside trails you’ll find. The lush forests surround you in a sea of green in every direction you turn. 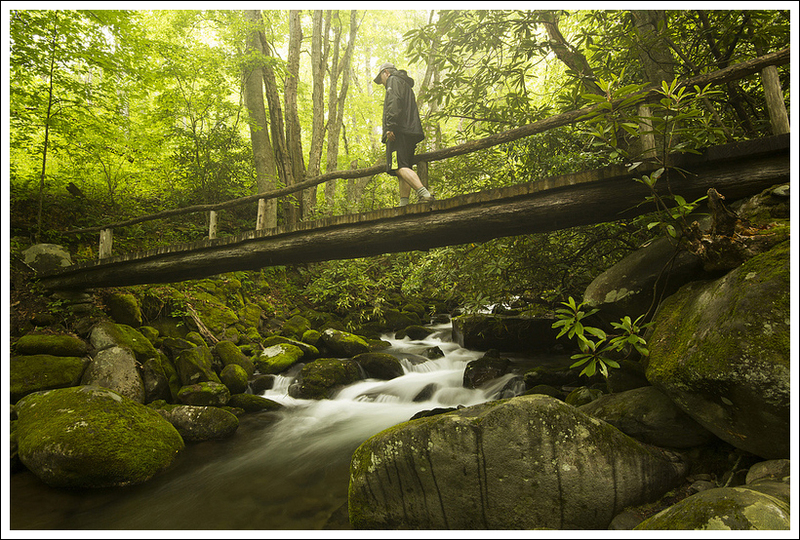 The trail starts off by crossing a large bridge, giving you great views of the Oconaluftee River. Once you cross the bridge, the trail starts off as wide and gravel-covered. At .2 miles, you will come across the remnants of the Civilian Conservation Corps camp that was here from 1933-1942. You’ll see signs of a stone plaque and a tall chimney, among other partial walls. At the .5 mile mark, you’ll reach your first footbridge over the stream. As you continue further, the trail continues a slow, gradual ascent to the end. You’ll cross three other footbridges, but these consist of narrow, split logs with wood handrails. The last of these was the only one I was a little concerned with crossing, since the handrail required you to stoop to be able to touch it and the log bounced some in the middle. The trail leads to the Kephart shelter, which was well-constructed. 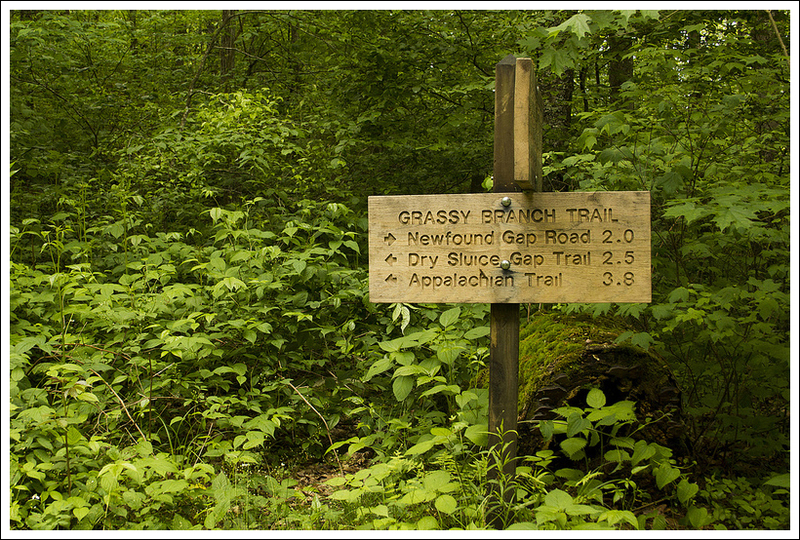 From the shelter, you can proceed on the Sweet Heifer Creek Trail which joins the Appalachian Trail in 3.7 miles or take the Grassy Branch Trail to the Sluice Gap Trail for a total of 3.8 miles to reach Charlies Bunion. Since this is a nice junction for an overnight trip, expect other people staying at the shelter in the nice summer-fall weekends. Backcountry reservations for overnight campers is $4/night and is required to be made in advance. See here for further regulations regarding backpacking permits. Kephart Shelter sits under the shady evergreens. You must have a permit to stay the night in this shelter. The stream runs behind/left of the shelter. There used to be a logging camp where the shelter now stands. Below: Most of the trail follows the stream closely; Adam makes his way across the bridge; A trail sign near the shelter shows the directions to other trails higher up the mountain. 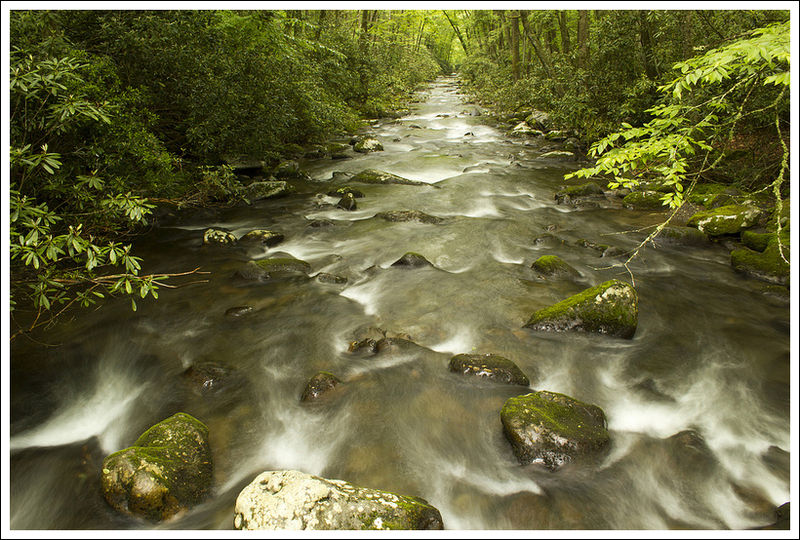 The Kephart Prong is named after Horace Kephart, who was instrumental in the establishment of the Great Smoky Mountains National Park. He was an extremely intelligent man, enrolling in graduate school at Cornell University at the age of 17. He became the head of the St. Louis Mercantile Libray, but he lost his job. He had turned to drinking and his wife and family left him for New York. He decided he wanted to re-establish himself in the wilderness of western North Carolina and Tennessee. There he wrote the book Camping and Wildlife, which was considered the “bible” of camping. When he became concerned that the Smoky Mountains were going to be heavily logged, he started writing letters to advocate for the establishment of this area as a national park. He soon became friends with a photographer, George Masa and together they started photographing and mapping this area. It was the partnering of Kephart’s words with Masa’s pictures that caught John D. Rockefeller Jr.’s attention, who donated $5 million to help purchase the lands to help secure the area to become a park. Kephart died in a car crash before the park was to be established, but Mount Collins was renamed Mount Kephart in his honor. 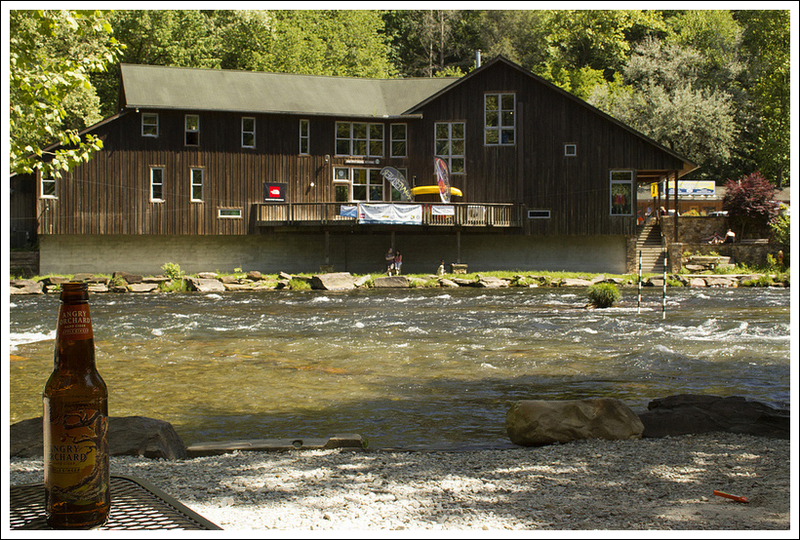 Big Wesser BBQ + Brew at the Nantahala Outdoor Center is a great place to enjoy drinks after a day on the trails. You can see the canoe/kayak course gates in the river. It’s fun to watch people coming down the rapids. 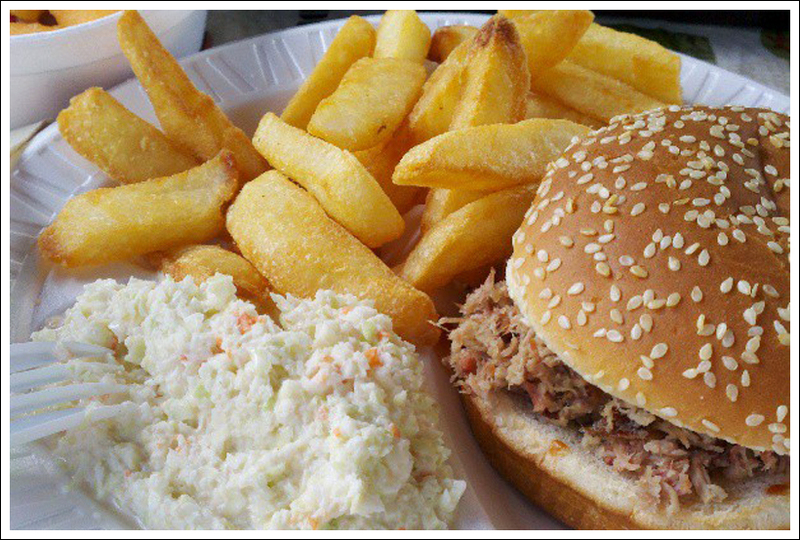 Below: Carolina-style BBQ in Bryson City. Another interesting spot almost immediately on the trail are the remnants of the site of the Civilian Conservation Corps (CCC) camp 411 here. You can see the large chimney and camp signboard on the side of the trail. This group of nearly 200 built rock walls, roads, trails, and footbridges that are still in use today. There is an interesting history of this from one of the leaders, James William Biggs. We enjoyed this beautiful trail and I can see incorporating this trail as part of a backpacking trip in the future. Elevation Change – About 770 ft. Difficulty – 1.5. The ascent on this hike is very gradual and easy. Trail Conditions – 4. The trail is well-graded and in great condition. Views – 0. No scenic views. Streams/Waterfalls – 5. Very beautiful! Wildlife – 2. We didn’t see anything other than chipmunks and squirrels. Ease to Navigate – 4. The trail is very easy to follow to the shelter. Once you reach the Kephart Shelter, you may decide to continue on. Solitude – 2. Because of the relatively short length and easiness of this hike, you will probably see a fair number of people. Directions to trailhead: Head north on US-441 N from Cherokee, NC. Head 4 miles north of the Smokemont Campground. 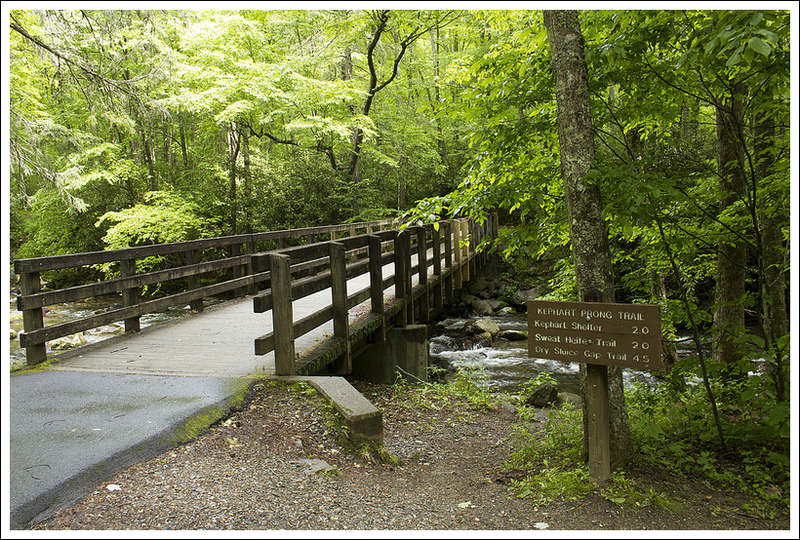 Parking is available on the shoulder of the road and the trail starts after crossing the bridge over the Oconaluftee River.